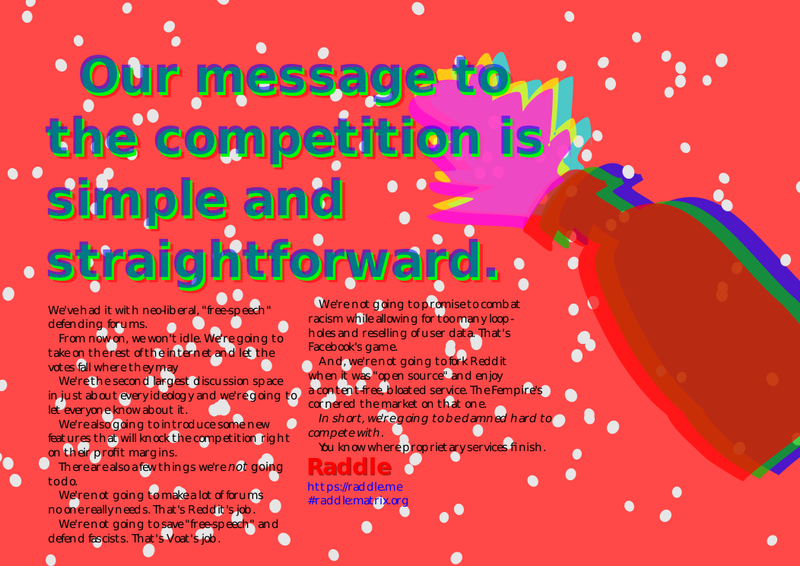 Hi everyone I made a poster to promote raddle with!! Claiming you created something when all you did was butcher it isn't in the spirit of communism. That's a lot more like capitalism. Like Led Zeppelin stealing from black artists and claiming it was their own work. on reflection I shouldn't said I made it. I bet it would have gotten the same reaction anyway. no one wants other people to use their work, I don't care if they say they're communist. Have you seen the whole open-source community? People base projects off of other people's projects and then sell them all the time-- no-one gets their feathers ruffled over it. A subraddle for discussing how to get more users on Raddle.